Israeli Prime Minister Benjamin Netanyahu on Sunday cautioned the West to avoid being fooled by the election of a purported moderate in Iran's presidential election, noting that the Islamic Republic is really ruled by radical Islamic clerics. 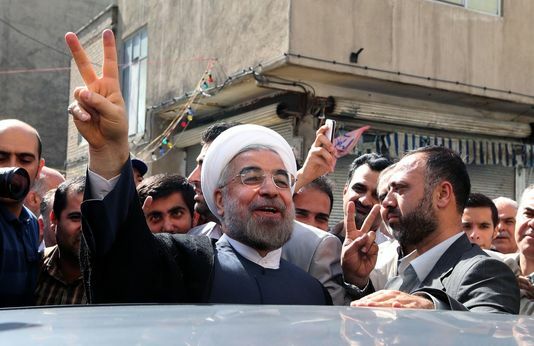 Over the weekend, Iranians overwhelmingly voted into power moderate cleric Hassan Rohani, who was backed in the campaign by reformist elements. Rohani campaigned on a platform of greater freedom in Iran, and had previously vowed to reinstate official relations with the US. That might be good news for Iranians. But when it comes to foreign relations, and especially Iran's nuclear program, Israel urged the West to continue treading very warily. "The international community should not be dragged into wishful thinking," said Netanyahu. "15 years ago they said [former Iranian President Mohammed] Khatami is moderate, but nothing has changed. Iran will be judged by its action regarding nuclear program." Iran is actually ruled by Supreme Leader Ayatollah Ali Khameini and his council of clerics. It should be noted that Rohani, while more pragmatic than his predecessor, Mahmoud Ahmadinejad, is a long-time supporter of the Islamic regime, and was a disciple of Ayatollah Ruhollah Khomeini, the leader of Iran's Islamic Revolution. An Israeli Foreign Ministry statement following the election pointed out that a number of Rohani's opponents in the election were disqualified by the ayatollahs, meaning the new president must not be too far off the mark of the official regime agenda. As such, it's probably too early to be speaking of a "revolution" in Iran. Nevertheless, the international community is likely to be taken in by the excitement, and Israel fears Rohani's election will buy the ayatollahs much more time to push forward their nuclear program. That might have been the point all along.